This is the feature-packed down bag you’ve always wanted. We’ve loaded this bag with the comfort-enhancing hallmarks Therm-a-Rest bags are known for, such as our SynergyLink™ Connectors, which integrate the bag with a mattress, and our ThermaCapture™Seams that trap your radiant body heat. Stuffed with water-resistant 650 Fill Nikwax Hydrophobic Down, and sporting integrated Quilt and Blanket Loops for sleep system customization, the three-season Questar is ready for your next backcountry adventure. The Questar is offered in three sizes, and designed to fit both men and women. Stuff sack and storage sack included. •	SynergyLink™ Connectors: Integrate the bag with a mattress for optimal comfort and efficiency; removable for versatility. •	ThermaCapture™ Seams: Trap radiant body heat and retain warmth without adding bulk or weight. •	Zoned Insulation: Maximizes warmth and saves weight. •	650 Fill Nikwax® Hydrophobic Down: Dries 3 times faster than untreated down without using dangerous PFCs. •	Toe-asis™ Foot Warmer Pocket: Rapidly warms cold feet. •	Quilt and Blanket Loops: Customize your sleep system by layering our quilts or tech blankets for increased warmth. •	Additional features: Heat-trapping draft collar, full-length zipper draft tube, snag-free zipper, cinchable hood and external zip pocket. Lets just get right to the point here. Sleep is just about the most important thing we can do to rest and rejuvenate our bodies. Without sleep we will never preform to our full potential and that means we will never have the adventure we truly want or deserve. It stands to reason that when planning a trip we should take special care to make sure our sleeping system is as comfortable and well equipped as possible. 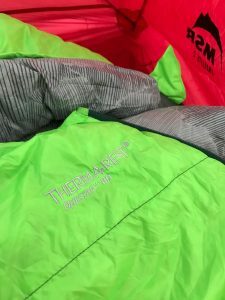 Therm-A-Rest has long been regarded as one of the best sleeping pads available. They have a reputation that is built upon offering great products that function as advertised. It should come as no surprise that their sleeping bags are top notch and pair perfectly with their sleep pads. The only question you need ask is what type of bag do you need? 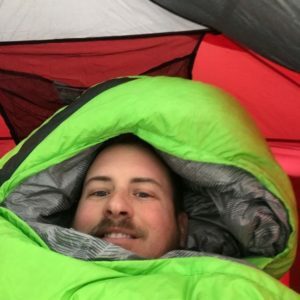 I have a pretty good selection of sleeping bags and most of them are rated for colder weather as that is when I am most active in the outdoors. I needed to find a bag that could carry me into fall but was cool enough for midrange temperatures as well. The Questar 20 seemed to fit the bill nicely. 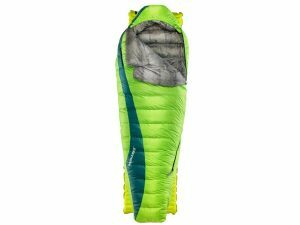 The Questar 20 is a 650 fill Nikwax Hydrophobic Down filled sleeping bag. It offers some great features such as loops and straps called Synergylink for integrating sleeping pads. The quilting design is optimal for holding heat and optimizing comfort. Additionally, this bag is designed to be a unisex bag and thus makes it extremely versatile. Add in the staggering light weight of just 2 lbs 5 oz and you have a real winner. The features of this bag are not the only thing that is alluring. This is a cool looking sleeping bag! I love the green color and so do my kids. My oldest daughter has already decided that she is going to claim this as her own bag now that I am done with testing. When I began testing I wanted to see just how versatile this bag could be. I decided to bring it with me while doing some couch crashing. I found that I was able to get a relatively comfortable night sleep indoors with temperatures in the 70F range. It was nice to know that when the temperature gets warmer outside this bag will still be tolerable. My daughter also tested this bag during several basement campouts and as I mentioned above she has decided to steal it from me. 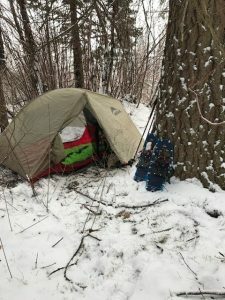 The real test came for me during a pack trip in the snow. I was also testing some MSR Lightning Ascent Snowshoes and I had planned a pretty fun little hike which ultimately dropped me below the really deep snow and into more manageable temperatures. I was really putting some serious stock in this bag as I knew that even though the weather man had called for temperatures in the high 30’s I could expect much colder. The night went off without a hitch. 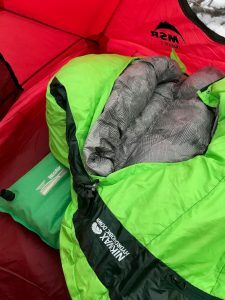 I used a Therm-A-Rest Neoair All Season pad under my Questar and while sleeping in my merino wool top and bottom I was snug as a bug all through the night. The Questar passed the test with flying colors. I have to say that I have yet to be disappointed with any Therm-A-Rest product that I have ever used. This is truly a great company with a great product line. 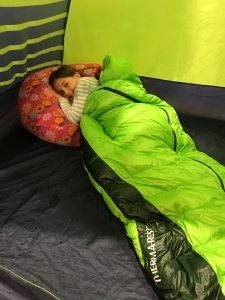 If you are looking for a moderately priced down sleeping bag the Therm-A-Rest Questar 20 should be a huge blip on your radar. I just cant seem to find anything that I really would change with this bag. If you shop for a bag that meets your appropriate needs I think you will be wise to buy any of the Therm-A-Rest sleeping systems. The Questar is just another great product from a great company. I give the Questar HD 20 a warm and fuzzy 5 stars!